Why Ship to the Bahamas? What can I send to Bahamas? What items are restricted? Deliveries are not available to all islands and customers may be required to collect their shipment at the main courier depot in Nassau. You may be travelling to the Bahamas on holiday, or for a very special honeymoon or wedding anniversary. You will want to bring plenty of outfits to keep you looking fresh and chic throughout your stay. If you are having trouble fitting your items within your airline’s baggage allowance, why not send your luggage to the Bahamas with Send My Bag, so you don’t need to worry about facing excess baggage charges at the airport? If you are a student going on spring break in the Bahamas, you will probably want to take part in some water sports. You can easily do this using your own equipment, by shipping it to the Bahamas with Send My Bag. Your sports equipment can be sent to your hotel, ready for you to pick up and use. Send My Bag can then collect your items again at the end of your holiday. No matter if you are going to the Bahamas for a romantic break, or if you are fortunate enough to be moving to the Bahamas for good, you can send your luggage and boxes with Send My Bag. Knowing that your luggage is being taken care, you can fully enjoy your journey to the Bahamas by avoiding the hassle of dragging heavy bags behind you through airports and onto buses. To learn more about sending luggage to the Bahamas, visit our ‘How it works’ page, or our ‘FAQs’. A holiday in the Bahamas is not just about lying on the beach; golf enthusiasts can also enjoy a round or two of golf. The top-rated golf courses include Paradise Island Golf Club, the Ocean Club on New Providence Island and Abaco Club on Winding Bay. Several of the hotel resorts on the islands provide golf courses. You can enjoy golf in this beautiful location using your very own golf clubs, by shipping them to the Bahamas with Send My Bag. Other than being able to use equipment that is familiar to you, you can also avoid having to wait around at bag drop or luggage carousels, or having to drag large golf bags behind you. See more information on how to send golf clubs with Send My Bag, including how to best package your golf clubs. The Bahamas caters perfectly for road cyclists, given its gentle terrain. What better way to explore the island you are staying on than by taking a leisurely bike ride? Send your bike to the Bahamas and enjoy using the bike you love. Your bike will be waiting for you at your accommodation when you arrive. Your bike needs to be taken apart and safely packaged up before being sent to the Bahamas. Check out our information on bike shipping to learn more. If you are relocating to the beautiful Bahamas, you will no doubt be looking into international removals to the Bahamas in order to transport your belongings there. Make sure you trust your removal company by researching them thoroughly and don’t hand any items over before they are safely and securely packaged up. You might decide to take your degree course in the Bahamas, at the College of the Bahamas in Nassau, and enjoy the beautiful surroundings at the same time. Send My Bag can send your possessions to your student accommodation, making your move an easy one. Send My Bag can help you ship everything you need to the Bahamas, from books, to writing materials, to clothes. Read more about student shipping on our student page and find out how to claim your student discount. Sending a parcel to the Bahamas with Send My Bag is a great idea if you don’t have so many items to send. A friend or family member can send you forgotten belongings to the Bahamas, or they can also use the service to send you gifts or care packages. Make sure you pick a sturdy box when sending a parcel to the Bahamas, and seal it up well so nothing gets damaged in transit. Read more about sending a parcel and find out what you can send with Send My Bag and how to package your items. If you have items ? such as dining chairs or a TV stand? that you want to get to the Bahamas, you could think about air freight. This normally takes one or two days, making it a quick service. It can be quite expensive, though, with costs increasing as your shipment size increases. You will probably also have to pay for a customs agent to sort customs clearance for you. Another expense to consider is getting your items to and from the airport, which means the price of using air freight could quickly mount up. If you send internationally by air freight to Bahamas your items will likely arrive at an airport such as Nassau, Freeport or Exuma International Airports. An alternative means of shipping large bulky items to the Bahamas is sea freight or container shipping. Sea freight shipping to the Bahamas can take a number of weeks, but it’s a good option if you don’t need your belongings immediately, given that it tends to be cheaper than air freight. However, you will still need to pay for the services of a customs agent and will need to arrange transport for your items to and from the ports. When using container shipping to the Bahamas, your items will most likely arrive by ship at one of the major sea ports, such as Nassau or Freeport. Shipments with a fair value over $50 will take an additional 24hrs to process. You may be required to visit the local customs office to clear the shipment. The climate in the Bahamas is pretty steady throughout the year. Between September and May, temperatures sit at around 21 - 24°C (70-75°F), which is slightly cooler than the summer months, when temperatures are around 27-29°C (80-85°F) and the humidity is higher. The Bahamas make an excellent holiday destination for those interested in water sports, given its clear water and inviting temperatures. Activities on offer include jet skiing, kiteboarding, kayaking, snorkelling, canoeing and even swimming with dolphins. 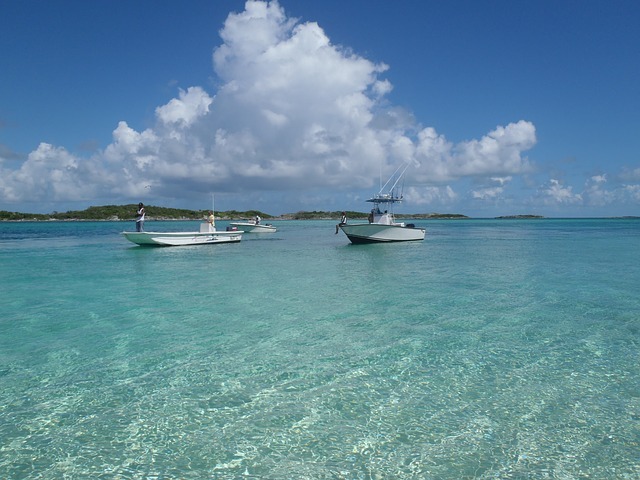 The Bahamas does not just offer stunning scenery and excellent beach holidays. There are also a number of historic sights to visit, predominantly in the capital of Nassau on New Providence Island. These include Fort Fincastle and Fort Charlotte, which provide insight to what it was like to protect the island in the late 18th and early 19th century. Nassau is also home to the Queen’s Staircase, created out of the limestone landscape between 1793 and 1794 and named in honour of Queen Victoria.